AZEK® Deck Boards have eliminated virtually all the problems of both wood and composite decking. Made of Cellular PVC, AZEK® Deck Boards have the look, feel, and sound of premium wood decking and come with a lifetime limited warranty! With all these great features, AZEK® Deck is your obvious choice. Over time it is also your least expensive choice! 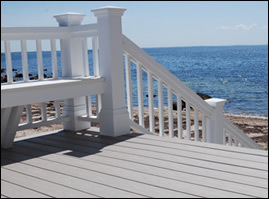 AZEK® Deck carries a Lifetime Limited Warranty by AZEK® Building Products, the leader in Cellular PVC technology. With more than 20 years of experience in Cellular PVC manufacturing, AZEK® also makes AZEK® Trimboards, the number one brand of trim. Together with AZEK® Deck, these high performance, low maintenance products have revolutionized the trim and decking industries! View a 5-part video series showing how one of our owners installed AZEK® Porch Boards on his own porch! (Porch Boards are tongue & groove and screwed through the tongue but otherwise procedure is the same for Deck Boards.) Series starts with repairs to the porch foundation and ends with a beautiful, authentic-looking, lifetime floor. Azek® Deck's proprietary embossing system creates one of the most aesthetically pleasing wood grain finishes in the industry. You'll enjoy the classic beauty of stained wood without the ongoing hassle of upkeep. This natural-looking wood grain finish provides the safety of a slip resistant surface while looking great! Ideal for boat docks, boardwalks, pool & hot tub surrounds, or any place a weatherproof flooring is desired. AZEK® Deck's Cellular PVC formulation resists natural and man-made stains such as wet leaves, fruit punch and the ketchup from your burger. Soap and water easily remove the kinds of discoloration which often permanently mark wood and composition decks. A strong, dense surface resists scratches from screws, tools and other gear during installation, so you can work with less worry. After installation, AZEK® Deck resists damage from everyday things like lawn furniture, dog claws and general traffic wear patterns. 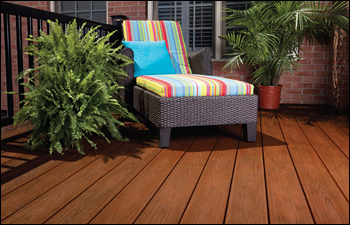 AZEK® Deck has the look, feel, and sound of wood. Installation is easy and uses the same tools and techniques as wood decks. But that's where the similarity ends! The long lasting color and enduring beauty of your AZEK® Deck will still be getting compliments long after wood decks of similar age need replacing. All colors can be ordered with optional grooved sides (bottom graphic at left) for installation with concealed fasteners, except Kona, which is only available Square Shouldered. If you are interested in a completely fastener-free surface, please inquire. Compare AZEK® Decking to other wood and non-wood decking materials, and it's easy to see the difference. Thanks to Colorfast Solutions(tm) by Americhem, Inc., one of the industry's leading color experts, you get vibrant colors that will hold up in the harshest climate and the hardest use. Deck colors in photos (from top of page): Slate Gray, RusticBark (discontinued color), Slate Gray (video), Clay (discontinued color). Click swatches below for a larger view. Click swatches above for a larger view. NOTE - Arbor and Vintage Collections plus Autumn Chestnut and Island Oak are not available Square Shouldered (plain sides) in 3', 6' or 12 foot lengths . 2. Overall length may be 1/4" shorter than what's listed but will be consistent for each shipment. 3. Lengths shorter than 12' are cut-to-order and not returnable unless defective. Shipping Info: Select one:- This item is 58’’ or longer. I read the 'Important Shipping Info' link above.- This item is less than 58’’ in length.